Hall of One Hundred Rivers, Dr. Sun Yat-Sen Garden, Vancouver, B.C. Canada, Co-organized by Canadian Society of Asian Arts, Asia Foundation of Canada and Dr. Sun Yat-Sen Classical Chinese Garden. Curator Yue Zhang was interviewed by CBC Radio. 2009 Pensacola Museum of Art, Pensacola, Florida, U.S.A.
2007 Randy Batista Gallery (former Media Image Gallery), Gainesville, Florida, U.S.A.
2006 Focus Gallery, University of Florida, Gainesville, Florida, U.S.A.
Pensacola Museum of Art, Pensacola, Florida, U.S.A.
Randy Batista, Gainesville, FL, U.S.A.
Tom Caswell, Gainesville, FL, U.S.A.
Peter and Ruth Sheng, Gainesville, FL, U.S.A.
Woo-sung Yoon, Miami, FL, U.S.A.
Teresa Yick, Honolulu, HI, U.S.A.
Yim Tse, Vancouver, BC, U.S.A.
Sam Wu, Burnaby, BC, U.S.A. Although I grew up in old Beijing, and embraced its rich traditions, I did not fully recognize its complex history, culture and art as a young child. And later, my busy life took me to places outside of the magnificent and exquisite architecture of the ancient capital city. With today’s massive political and economic changes, the ever-increasing pace of urbanization, and the recent overhaul of the city in preparation for the 2008 Olympic Games, the old city gates, old city walls, hutongs, and residential courtyards that bear so much historical, cultural, artistic values are vanishing from our sight. Only then had I realized what our nation is losing…the spirit of a place and the soul of its people. The grandiose and highly ordered layout of imperial Beijing and the vernacular fabric of a city built upon a thousand years of history are wonders of human culture. The hutongs of Beijing (networks of small alleyways that lead to courtyard houses) give witness to the city’s evolution, and are like a living museum that holds the clues to an enduring way of life. Beijing quadrangle courtyards are the most elaborate examples of Chinese vernacular dwelling. Their ethnological character and variations of style, along with their delicate but powerful decorative elements, are of significant historic value and cultural meaning. 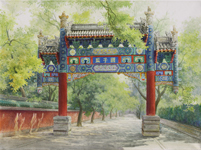 Beijing’s royal palaces and temples represent a pinnacle of achievement in Oriental architecture. And the totality of Beijing’s architecture is not only defined by the intensely layered physical occupancy of geometric spaces, but through the spirit, and the scenery of the soul, of a whole nation. It is this scenery that touches our heart deep down. Human minds are connected, and we all marvel at the architecture of the Parthenon, the Egyptian pyramids, the Arc de Triomphe, Ankor Wat, and Taj Mahal. The old cityscape of Beijing is also appreciated by people all over the world. As early as the end of the 19th century and the beginning of the 20th century, foreign photographers and writers recorded the vibrant life of Beijing’s hutongs, now vanishing, and leaving behind only fragments of this once continuous whole. It is true that what is gone later becomes the most precious. While I cannot prevent its loss, I use my brushes to hold onto the fragments and memories of old Beijing. Through this work, I am carrying out a personal mission to advocate the preservation of Beijing’s culture and the continuity of our history.